For the past few weeks I have experienced an issue with the server browser. It will barely load any servers. When I refresh the server browser, it only shows about 20 servers, often not the ones I’m looking to join. I also cannot join my friends through Steam either, nor can I see server info when I right click a server. I have tried looking at my Firewall, followed a steam guide that told me to mess with some files, and I have verified integrity of game cache. Now I will try to download Remixx’ alternative server browser. This is obviously making it hard to play the game, so I’d like to hear if anyone have had experience with this issue? It’s possibly your router dropping responses if it thinks it is getting flooded or something. 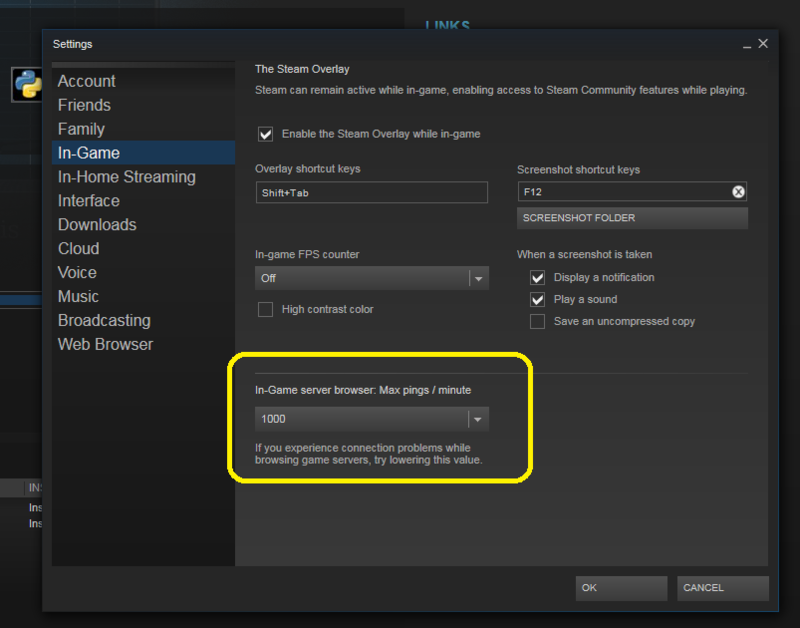 Go to Steam -> Settings -> In-Game, and adjust the max pings per minute. Turn it down to 500 or 250 and see if that helps.